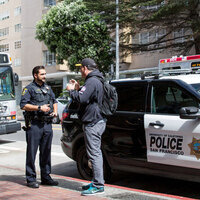 The UCSF Police Department is undergoing re-accreditation, a voluntary process renewed every three years to demonstrate its compliance with national best practices. As part of the on-site assessment, UCSF employees and members of the community are invited to provide comments in person, by telephone or in writing addressing the UCSF Police Department’s ability to comply with 484 CALEA standards. A copy of the standards is available at the UCSF Police Department, 654 Minnesota Street, San Francisco. Join in person at a public information session held at the UCSF Police Department. Public comment will be limited to 10 minutes per person.